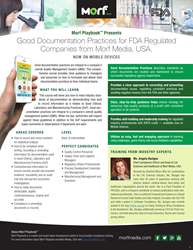 Morf Media Inc., shaping the future of enterprise talent development with compliance training, today announced a new FDA compliance training course, Good Documentation Practices on Morf Playbook™. The RAPS (Regulatory Affairs Professional Society) accredited course on Morf Playbook—now conveniently available on smartphones and PCs - allows managers operating at companies in a Good Clinical, Laboratory and Manufacturing Practices (GxP) environment to meet requirements to ensure product quality and product safety. Excellent standards for documentation within a company can be critical in manufacturing quality products that are safe as well as successful during audit situations,” said Angela Bazigos, FDA training expert. Good documentation practices are integral to an organization’s overall Quality Management System (QMS). While not law, authorities will inspect against these guidelines in addition to the GxP requirements and make comments or observations if departures are seen. The proven course provides clear guidance to quality control personnel, supply chain managers, regulatory affairs professionals, process design scientists and management and manufacturing management and scientists on how to formulate and deliver best documentation practices to their teams. The new course on Morf Playbook allows professionals to provide expert records, streamline processes, reduce negative reviews and outcomes, and improve record consistency. It provides a clear approach to correcting and preventing documentation issues, regulating consistent practices and avoiding negative reviews from the FDA and other agencies. Training offers clear, step-by-step guidance that helps ensure strategy for delivering high-quality products at a profit with consistent operation of all systems. How to make documents attributable, legible, contemporaneous, original and accurate. The courses are individually available and are also available with the complete Morf Playbook training system. With its built-in authoring, reporting tools and analytics to measure an individual’s progress, Morf Playbook provides a secure platform with personalized recommendations for remediation, tracks course progress and completion, exam proficiency and provides certificates of achievement. For more information about Morf Playbook courses and Morf Playbook platform, visit Morf Media.com or contact Natalia Glatcovschi at natalia@morfmedia.com.